Whereat I: "Master, say, what town is this ? Charles Saatchi: Does a love of art, particularly Renaissance art on a biblical theme, make one feel closer to God? 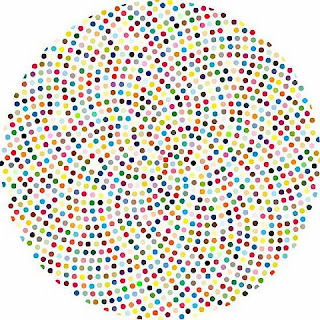 Damien Hirst: I believe God must be very disappointed in his handiwork. Mankind has clearly failed to evolve much in all these years; we’re still as cretinous and barbaric as we were many centuries ago, and poor God must spend all day shaking his head at our vileness and general ineptitude. Or perhaps, we might just give him a good laugh. But of course, I hope God likes our art enough to forgive us our sins, particularly mine. Will his Atheist friends hold an art exhibit after Damien Hirst blows his brains out all over the wall. His Atheistic demented friends will most likely cut out the portion of wall that contains the artist's brain fragments and dried blood and will hold some major exhibit. It might be a money maker if the demented and tormented artist sells tickets ahead of time to an elect few Atheists who would love nothing more than to witness the event, call it a final act into nothingness. Really now? "Valium" is the best Atheistic art you scumbag Atheists can come up with? Cardinal Dionigi Tettamanzi, 66, [then] the archbishop of Genoa has published 10 rules on how to resist Satan's temptations. Cardinal Tettamanzi dedicated his lenten letter to combating the fascination of a devil who is charming, shrewd and very real. (5 March 2001) Those who follow his 10-step programme are promised the ability to rebuff offers of forbidden fruit, unlike Adam and Eve. First rule: "Do not forget that the devil exists." Rule two: "Do not forget that the devil is a tempter." Rule three: "Do not forget that the devil is very intelligent and astute." Rule four: "Be vigilant in the eyes and the heart." Rule five: "Be strong in spirit and virtue." Classified By: ECPO A/Mincouns Catherine Hill-Herndon for reason 1.4 (d). At the Laker game with @KyleRichards18. VATICAN CITY, 26 JAN 2011 (VIS) - During this morning's general audience, celebrated in the Paul VI Hall in the presence of 3,000 people, Holy Father dedicated his catechesis to St. Joan of Arc (1412-1431), whom he described as "one of the 'strong women' who, at the end of the Middle Ages, fearlessly brought the splendid light of the Gospel into the complex events of history". The life of Joan of Arc, who was born into a prosperous peasant family, took place in the context of the conflict between France and England known as the Hundred Years War. At the age of thirteen, "through the 'voice' of St. Michael the Archangel, Joan felt herself called by the Lord to intensify her Christian life and to act personally to free her people".